Trevor Weinrich had an article yesterday praising Phil Pressey for all of the abilities he has. In the end, Trevor believed Pressey was better than Ben McLemore, the Kansas standout. 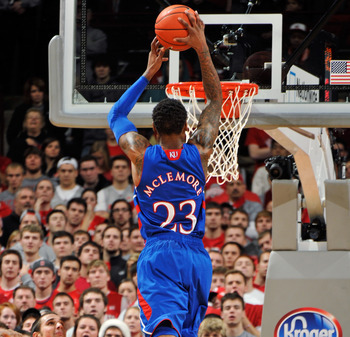 Trevor ended the article saying, “Which side do you choose?” I choose the McLemore side, for all of the right reasons. I believe a player’s importance to a team is much more important than his stats. Is Phil Pressey important to his team? Definitely. His point guard play is unreal, and I believe he is one of the best in the NCAA. When I look at Ben McLemore, though, I see an on-court leader whose talents are able to control the tempo of the game and the tone of the crowd. Whenever McLemore dunks the ball, or drains a three, it is more than likely astonishing and his teammates become motivated to make the next big play. Along with teammate motivation comes the way a crowd reacts. If the game is in Lawrence, the crowd will reach a high number on the decibel scale and the opponents will go cold from the field. If the game is on the road, the crowd will go dead silent and momentum will be in favor of Kansas. With that being said, my point is Ben McLemore is a better leader than Phil Pressey is. Sure Pressey makes awesome passes that make you say, “Wow,” but I think that because McLemore is a redshirt freshman, yet a great leader, he gives his team more of a boost. I may be going deeper than I should, but the momentum of a team is maybe the most important part to winning a basketball game. Then there are the stats. McLemore puts up almost 17 points per game compared to Phil Pressey’s near 14. Assists wise, Pressey obviously has the edge since he is a point guard, dishing 7.5 a game next McLemore who only has a mere 2.1. Every other stat, McLemore absolutely owns Pressey. Ben grabs 5.2 boards a game and Pressey snatches just 3.4. McLemore has a free throw percentage and a three point percentage that absolutely demolishes Phil Pressey’s. Stats wise, the edge goes to McLemore as well as the momentum factor. 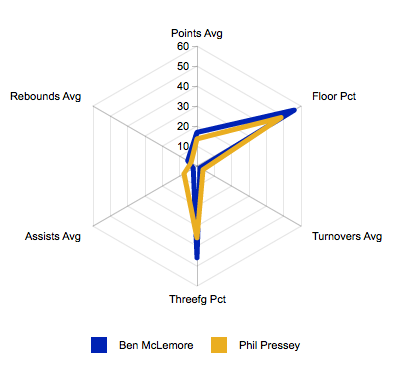 Here is a graph comparing McLemore and Pressey. Ben McLemore’s X-Factor and stats mean so much more to Kansas than Pressey does to Mizzou. Missouri fans would say differently, of course, but on a national level, I would bet a majority would say McLemore. Trevor says hands down Phil Pressey is the better player. For me, I say without question Ben McLemore is better than Phil Pressey. Unfortunately, there is no chance of the two going head-to-head this season. However, we will have to wait and see what the Madness of March may have to give. This entry was posted in Basketball, Basketball, Midwest, National and tagged Ben McLemore, Kansas Bask, Kansas Jayhawks, Missouri Tigers, NCAA Basketball, Phil Pressey.